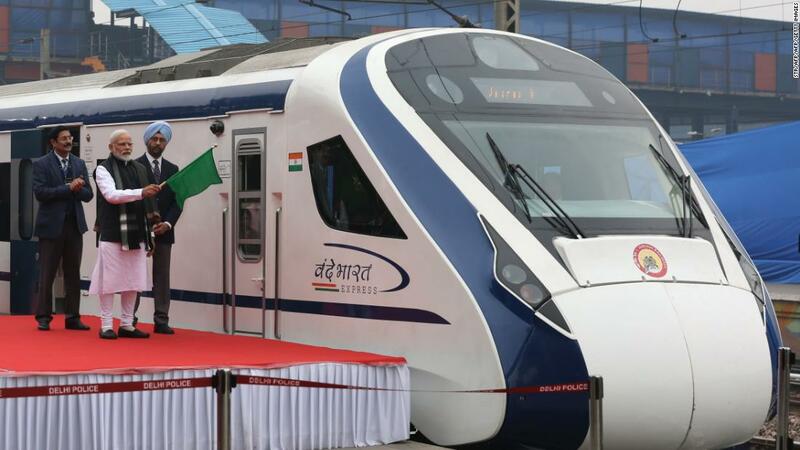 The Vande Bharat Express was returned to New Delhi from the northern city of Varanasi on Friday before it was forced to stop at Chamrola Station, located about 120 miles away from the capital. According to a statement released by India's Railway Ministry on Saturday, there were communication issues between the last four coaches and the rest of the train due to an "external hit." The brakes were then applied and the "train" was checked for faults and moved to Delhi, "the statement continued. The Vande Bharat Express's initial trip from New Delhi to Varanasi was successful. 00mph (160km / h). ] Its production comes under Modi's ambitious Make in India initiative to transform the country into a global manufacturing hub. "This is the true strength of India. This is the strength of the Vande Bharat Express. In the last four and a half years, through hard work and honesty, we have tried to change the Indian railways. Bharat Express is a glimpse of that work. In the past years, the railways have stayed in a sector, which under Make in India has made great progress, "said Modi as he inaugurated the train on Thursday. Other trains currently operating on that route take more than 11 hours to complete the same trip. The train made its first commercial trip on Sunday with India's Railways Minister Piyush Goyal tweeting that tickets had been sold out for the next two weeks.